In this unit on motion, you will learn how to measure, compare and report changes in your own position and the movement of objects around you. You should have a conceptual, mathematical or graphical understanding of the following topics. Speed is a rate. It is the distance an object travels in a given amount of time. Velocity is the speed and direction of an object. The change in an object's velocity over time. Objects with negative acceleration slow down. Objects with positive acceleration speed up. Distance is the number of units travelled between two points in space. 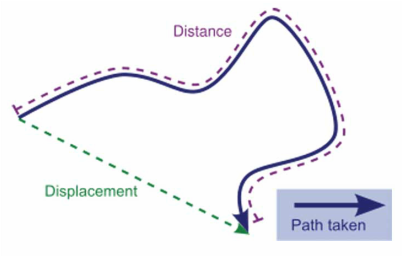 Displacement is the shortest distance and compass direction an object is from its starting point. Reference frames are coordinate systems used to measure distances and changes in an object's position. They can have up to three dimensions of space and a fourth dimension of time. The fixed reference point is called the origin. 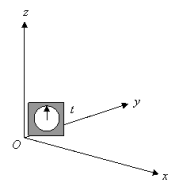 A visual method of describing a change in position over time. The slope of the line is the speed of the object. The link below is an excellent retro production about inertial, accelerating and rotating reference frames. Speed - Time graphs can be used to analyze acceleration. The link below is a webpage discussing related concepts and calculations.